In June 2016, an historic ruling from the U.S. Supreme Court reaffirmed a woman’s constitutional right to access safe, legal abortion. Now, it’s time for Congress to do its part. Fights to improve access to abortion care will continue. We need the Women’s Health Protection Act to prohibit states from imposing a range of restrictions on reproductive care that shame women for their decisions and limit access to safe, legal abortion care. 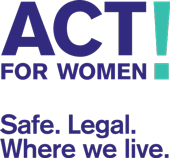 I stand with the Act for Women campaign and call on Congress to pass the Women’s Health Protection Act.